I hope everyone made it to school or work on time this past Monday. The start of Daylight Savings is my most anticipated weekend of the year. Losing that extra hour of sleep in exchange for the seven or eight months of additional evening sunlight is more than a fair trade-off. For me, it has always marked the time during soccer season when practices become more enjoyable. The extra hour of sunlight makes scheduling and attending practices much easier. Plus, Spring is just around the corner. I was at my son’s practice the other day and was asked to play in goal during a small-sided game with large goals. One thing I noticed when I tried distributing the ball to my teammates was that many of them were not ‘springing forward’ to receiving the ball. In soccer, it is critical to constantly move without (or off) the ball. If it is the player’s desire to receive the ball, he/she must always look for and move into open space. Oftentimes, the open space can be where the player is currently standing. When this is the case, standing there is not enough. In this instance, a player should also move toward the player with the ball. In honor of daylight savings, a player should ‘spring forward’ to that player. Moving toward the player with the ball indicates to the passer that you are making yourself available for the ball and that you are open. This visual cue will catch the passer’s attention and will result in a greater chance of receiving a pass. Springing forward will significantly reduce the chance of a defender stepping in front of the pass and taking the ball away. In American football, it is the equivalent of a receiver needing to step towards the quarterback’s throw. When this is not done, a cornerback can easily step in front of the pass for an interception. As the goalie during practice, there were a few things I did to get the players to move toward me. I made eye contact with my teammates and gestured with my hands to have them spring forward into the open space. I verbally asked them to “check in”. I rewarded good behavior by passing the ball to the players checking in. I held onto the ball as long as possible giving players ample opportunity to check in. Only when an attacker was about to take the ball away from me did I make a pass to the outlet player. I really like descriptive expressions and clever mnemonic devices. ‘Spring Forward’ certainly qualifies as one. There is no mistaking in which direction to move the clocks in March. In soccer, this expression also paints a pretty descriptive picture is terms of how players should move when the open space is directly in from of them. ‘Spring Forward’ and prosper! I’m not a big fan of throw-ins. When I coached, I spent very little time on thrown-ins. I never had throw-in warm-ups. I never designed throw-in plays. My preference was to spend more time on soccer fundamentals, such as the first-touch, and playing small-sided games. I surprise myself that I am even writing about throw-ins. But year-after-year I see too many teams doing the wrong thing on throw-ins, so I feel I need to write about it. This is the first in a series of throw-in posts. A peculiar tactic I see many coaches employ on throw-ins at all age levels is what I call, “the check-in, check-out” move. This is where a field player runs toward the thrower (checks-in) and then turns and runs down the wing (checks-out). While this is a good tactic to use a few times during a game and catch the opponents off guard, using it ALL the time simply does not work. A team that employs this tactic is literally and figuratively ‘throwing in the towel’ or ‘throwing away an opportunity’ on a play that can and should be much more advantageous to the team in possession of the ball. A much better approach is for a team to simply have its players check-in to the thrower. There are many advantages to checking in. A team will increase its possession percentage by retaining the ball much more often. A ball thrown to a player facing the approaching ball will receive and possess the ball much easier. It creates movement on the field. A field player is able to separate him/herself from a defender. Open space is created when a player checking-in vacates or moves away from the area. If a defender is on the field player, play it cool. Referencing ‘Box 1’ below, when it is time to check in, the player (A1b) quickly breaks away from the defender (D1) in a quick burst. It a player is cool and appears nonchalant, the burst will leave the defender flat-footed and create greater distance between the two players (A1a). Now reference Box 2. If the defender (D3b) is marking a player (A3b) tight, the field player may need to first move away from the thrower (check-out) before turning and breaking to the thrower (A3a). This will leave the defender (D3a) further away from the play. Before checking in, the field player should make eye contact with the thrower. If the thrower is unaware of the field player’s intentions, he/she may not be prepared to throw-in the ball to the approaching player. If the thrower is not aware of or does not see the player checking in, communicate with a command such as ‘Ball!’ or call the thrower’s name to get his/her attention. If the ball is not thrown to the player checking in, that player should cycle-through the check-in. The worst thing for a player to do is just stand still waiting for the ball to be thrown to him/her. Not only is that player in all likelihood covered but when a player receives a ball flat-footed, the next moves are limited. Veer away from the thrower and let another check in. By far and away the biggest advantage to having players check-in on throw-ins is the carryover effect it has on all aspects of the game. During the course of a game, players should always be ‘checking in’ with the players who have the ball. Checking-in does not always mean running directly at the player. Checking-in also means checking in to the open space to give the player with the ball many options to pass the ball. 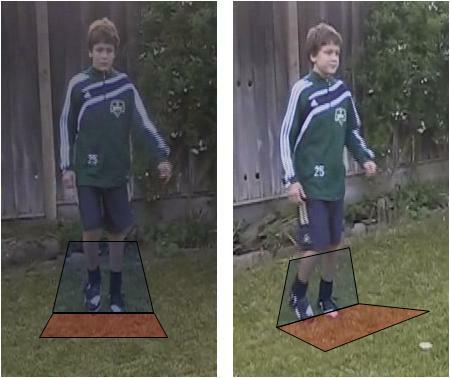 Teach and reinforce the skill of checking-in with field play. Then when it comes to throw-ins, the players will check-in naturally.